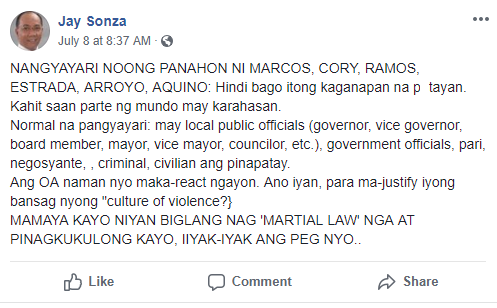 Home / Opinion / Jay Sonza: "MAMAYA KAYO NIYAN BIGLANG NAG 'MARTIAL LAW' NGA, IIYAK-IYAK ANG PEG NYO.."
Jay Sonza: "MAMAYA KAYO NIYAN BIGLANG NAG 'MARTIAL LAW' NGA, IIYAK-IYAK ANG PEG NYO.."
Jay Sonza veteran broadcaster and former TV host, once again wrote a very striking opinion, this time about the successively slayings of politicians in the country. Known to be fearless in speaking his mind to various political issues, Sonza then again took to social media to give his standpoint on what seems to be an unaccustomed incident and occurrence to some, yet as per him, is not in reality new since political bloodshed likewise happened even before the administrations of former Presidents Ferdinand Marcos, Cory Aquino, Fidel Ramos, Joseph Estrada, Gloria Macapagal-Arroyo and Noynoy Aquino. 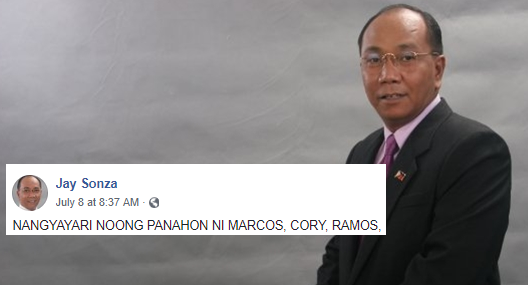 "NANGYAYARI NOONG PANAHON NI MARCOS, CORY, RAMOS, ESTRADA, ARROYO, AQUINO: Hindi bago itong kaganapan na patayan. Kahit saan parte ng mundo may karahasan. ", he wrote. Sonza then said that it is actually a normal circumstance that there are local public officials, government officials, priests, businessmen, criminals, civilians that are being slayed and some are just over-reacting, to maybe justify their claim, calling the present administration the "culture of violence". "Normal na pangyayari: may local public officials (governor, vice governor, board member, mayor, vice mayor, councilor, etc. ), government officials, pari, negosyante, , criminal, civilian ang pinapatay." "Ang OA naman nyo maka-react ngayon. Ano iyan, para ma-justify iyong bansang nyong "culture of violence? ", he exclaimed. The veteran journalist correspondingly warned those people that if the government will impose direct military control or martial law, they will end up crying. 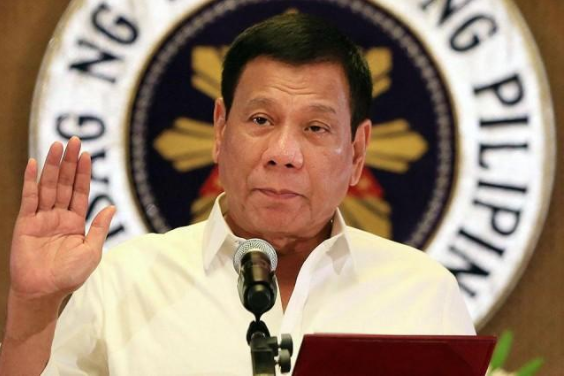 "MAMAYA KAYO NIYAN BIGLANG NAG 'MARTIAL LAW' NGA AT PINAGKUKULONG KAYO, IIYAK-IYAK ANG PEG NYO..", he uttered. "NANGYAYARI NOONG PANAHON NI MARCOS, CORY, RAMOS, ESTRADA, ARROYO, AQUINO: Hindi bago itong kaganapan na patayan. Kahit saan parte ng mundo may karahasan. Normal na pangyayari: may local public officials (governor, vice governor, board member, mayor, vice mayor, councilor, etc. ), government officials, pari, negosyante, , criminal, civilian ang pinapatay. MAMAYA KAYO NIYAN BIGLANG NAG 'MARTIAL LAW' NGA AT PINAGKUKULONG KAYO, IIYAK-IYAK ANG PEG NYO.."